We are all looking forward to the days when our computer screens will be as thin as a piece of paper, and it would appear that Samsung’s new ultra-thin flexible AMOLED screen is about ready to herald in that era. 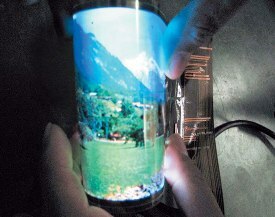 Sure, this 6.5 inch flexible OLED that you see here is just a prototype, but you can at least see how flexible it is. In fact, I wouldn’t be surprised if you could spindle it. That is, roll it up like a kid who plays “telescope” with an ordinary piece of paper. I can think of one application for this technology that I saw in a movie. In Red Mars, Val Kilmer has a mobile computer that must have a very flexible AMOLED screen. This screen took up a minimal amount of space, as he was able to retract it into its tiny case like a window blind. I realize that many of you might not remember that 2000 movie, which was set in the year 2050. As I recall, the AMOLED was able to recognize Martian landmarks just by holding the screen up to them. I’m not certain if Samsung is working on that, but they will probably have it perfected by the mid-century. That isn’t a quote from the company, but it is a personal prediction. In the meantime, let us all sit back and dream of classrooms of the future, where the teacher hands out a test on very flexible AMOLED paper. I would imagine that after the students were finished, he or she could stack them in a pile, put them in a machine, and they would have their grades in seconds. Think of other uses for AMOLED displays while you are at it, and put them in the comments section. Instead of having to use multiple pieces of paper over the years for tests and stuff, what if u could use (for a class of 20) 20 of those? and they use it, u download the answers and use the same sheet again, no waste of paper! and that way less “real” paper will be needed!!! There is no doubt that this technology will merge cell phones, computers and other devices so that people will be walking around with all-in-one devices instead. It will be interesting to see if a competing technology will emerge as a prefered method of viewing our media and data. It is too soon to rule out glasses with enhanced displays built into the lenses or even contact lenses with visual display technologies. The bendable screen does seem to be closer to being a reality at this point than those other ideas. OLED is here and is going to rule the world for sure. Does that mean I would be folding my 42 inch LED TV and put that in my pocket after few years? Amazing things happening around. Can we really think anything is impossible.